2009 resulted in a limited touring schedule for Linkin Park as they worked on their highly anticipated fourth studio album and allowed Chester to promote his side project, Dead By Sunrise. Taking a break from the studio, the band launched a small scale tour of Europe and Asia with North American stops as bookends. Starting with a private rehearsal for a small number of fans in California, the band prepared to perform at the world premiere of Transformers 2: Revenge of the Fallen for which they'd created a single ("New Divide") and worked on some of the score. The band then went into full-fledged festival mode, appearing at no less than nine festivals in a seventeen show run which featured stops in Turkey, Greece, Russia, the UK, Germany and Japan among others. Along the way, the band took the opportunity to give Dead By Sunrise some stage time in an effort to promote their recently released album. 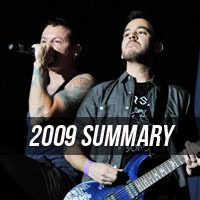 DBS's three songs ("Fire", "Crawl Back In", and "My Suffering") were sandwiched between the main Linkin Park set and the three song LP encore at six shows (Stuttgart, Knebworth, Gräfenhainichen, Chiba City, Osaka, and Pomona). Random headlining shows in concert halls, arenas and open air stages dotted the tour as well for Linkin Park, returning to several venues they've played before as well as new ones. The last show in Pomona unfortunately had the power go out in the middle of "Breaking The Habit", causing the DSP for the first half of the show to be lost, resulting in Pomona not being released. However, the show was webcasted online by KROQ for LP fans worldwide. The setlist for 2009 featured a few interesting changes for LP. "Session" was brought back in abbreviated form like it was in 2003, being played for the first time since the March 25, 2003 Meteora release show in Los Angeles. Long intros from "No More Sorrow" and "What I've Done" dotted the setlist, along with a new outro to "Points Of Authority". Mike took the time to do a few requests over the outro, including verses from "Reading My Eyes", "Dedicated", "Step Up" and "A Place For My Head" during the tour. A fan-favorite new keyboard transition from "Numb" to "Breaking The Habit" was played and Rob introduced a new drum solo intro for "Bleed It Out". Lastly, Mike integrated both verses of "Hands Held High" into the live show for the first time, rapping verse one acapella followed by verse two over the "Krwlng" intro to "Crawling". The encore of "New Divide", "Faint", and "One Step Closer" proved to be one of the best for the band in recent years. 2009 saw three shows rescheduled which had been cancelled the year before (Taipei, Shanghai and Macau) and, for the first year since 2006, had no shows cancelled. 2009.08.11 Okinawa: No opening band. 2009.08.15 Shanghai: No opening band. This page was last edited on 28 March 2019, at 15:52.